The Jewish Museum and the Center of Tolerance open in Moscow. 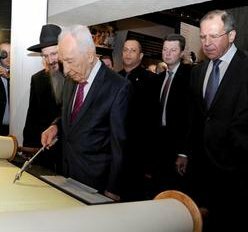 “This museum is an eloquent declaration of the principles of tolerance toward people and their freedom,” said at the inauguration Israeli President Shimon Peres, 89, who was born in what is now Belarus before his family settled in Palestine in the 1930s. Peres recalled that both his parents had been born in the Russian Empire and everyone at home spoke “Yiddish, Hebrew and Russian”, while his mother had sung him Russian songs. “Here we can see man part with the past and move into the future with hope.” “The museum tells us about two ideologies – communism and Zionism,” he added. President Vladimir Putin hoped the new museum would become “a place for dialogue and agreement between peoples,” said a statement read at the ceremony by Lavrov. “Any attempt to review the contribution of our country to WWII victory or to deny the Holocaust is not just a cynical lie but a forgetting of history,” Putin’s statement added. The idea of establishing the museum came from the Federation of Jewish Communities of Russia, which was given the museum building in 2001. Grafts’ renovation and expansion of the 1927 Konstantin Melnikov’s bus depot have transformed the space into the world’s largest Jewish museum. The museum occupies over 8,500 square meters on the Moscow Bakhmetyevsky Garage which was formerly an art gallery run by socialite Dasha Zhukova. The museum aims to demonstrate Jewish cultural traditions and customs and also show the history of Russia through the prism of one ethnic group, organizers say. Like its ‘twins’ in New York, Paris and Berlin, the Moscow museum highlights historic Jewish documents, photographs and letters spanning a period of more over two centuries. Jews were repressed in Tsarist times when starting in the late 18th century they were largely forced to live in an area of the western Russian empire known as the “Pale” where many lived in impoverished towns known as shtetls. Hitler‘s armies in World War II then occupied most of today’s Belarus, Ukraine as well as western Russia, leaving Soviet Jews exposed to the full brunt of the Nazi killing regime.Heavily targeted during the 1930s purges, Jews suffered even after World War II in the USSR under Stalin’s rule, especially when the purported discovery of a so-called “doctors’ plot” against him unleashed a wave on anti-Semitic hysteria. Nonetheless Jews have over centuries made a huge contribution to Russian culture, ranging from the writer Sholem Aleichem, the Vitebsk-born artist Marc Chagall or the poet Osip Mandelstam who died in the Stalin camps.